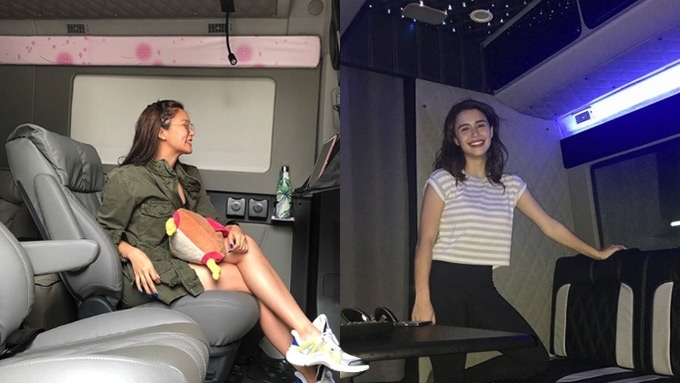 Kim Chiu and Yassi Pressman are among the celebrities who had their vans converted into luxurious living spaces. When showbiz stars are at their busiest, the road becomes their second home. That is why many of them have had their vans converted into mobile homes by Atoy Customs, their favored car shop. Atoy Customs has popularized the term "Manila-proofed," which owner Atoy Llave described as equipping the vans with "everything from beds and toilets, to souped-up entertainment systems—basically making them ready to take on traffic hell." The One True Love actress specifically requested for pink details to make her "super comfy" van more homey. The FPJ's Ang Probinsyano had a memorable 23rd birthday this year when she finally got her dream minibus. As soon as she got a hold of her new set of wheels, Yassi had it customized at Atoy's custom car shop. Kylie held a mini photo shoot inside her customized van to show how spacious it is. She particularly loves the white on black stitches on her leather seats. Her caption reads: "Sobrang astig ng ginagawa mo sa kotse ko!" The Kapuso star had an entertainment system upgrade on her Starex VIP, and now she enjoys watching movies on her flat screen TV even while on the road. The young actor-MYX VJ customized two of his vans at Atoy's car shop. The Journey frontman can take his concert on the road as well, thanks to the karaoke system installed in his Manila-proofed van. Since Aubrey and Troy's family are expecting a new member this month, the couple had their SUV upgraded. "It's gonna be so much fun sleeping in my captain's chair." The father-son duo now have comfier travels, thanks to the installed lounge chairs. Their van also comes with its own dresser. How much do you need to get your van "Manila-proofed"? On Instagram, Atoy's reply to one of the queries was: Up to PHP850,000 to PHP1.2 million "depending on specs."